If we wanted to also keep TV series and mini series in our movie table, we would need another field to store it: MovieKind. As we didn&apos;t add it while creating the Movie table, now we&apos;ll write another migration to add it to our database. Don&apos;t modify existing migrations, they won&apos;t run again. If we build and run our project now, we&apos;ll see that there is no change in the Movie form, even if we added Kind field mapping to the MovieRow. This is because, fields shown/edited in the form are controlled by declerations in MovieForm.cs. Uncaught Can&apos;t find MovieTutorial.MovieDB.MovieKind enum type! Whenever such a thing happens, e.g. some button not working, you got an empty page, grid etc, please first check browser console for errors, before reporting it. Why We Had This Error? This error is caused by MoveKind enumeration not available client side. We should run our T4 templates before executing our program. Now in Visual Studio, click Build -> Transform All Templates again. Rebuild your solution and execute it. 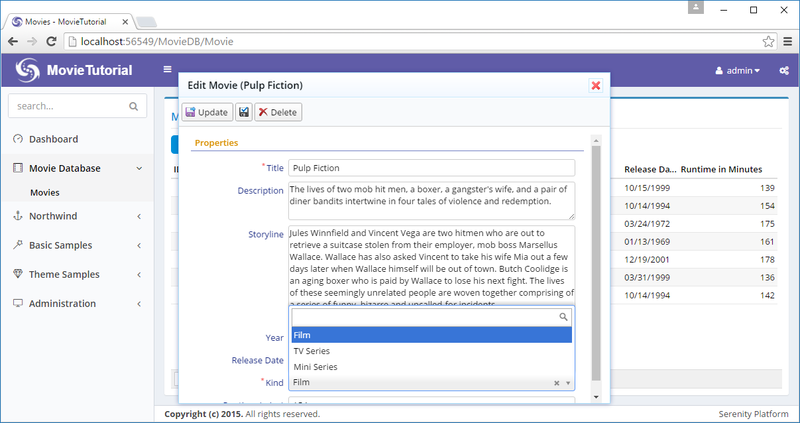 Now we have a nice dropdown in our form to select movie kind. As Kind is a required field, we need to fill it in Add Movie dialog, otherwise we&apos;ll get a validation error. But most movies we&apos;ll store are feature films, so its default should be this value. Now, in Add Movie dialog, Kind field will come prefilled as Film.